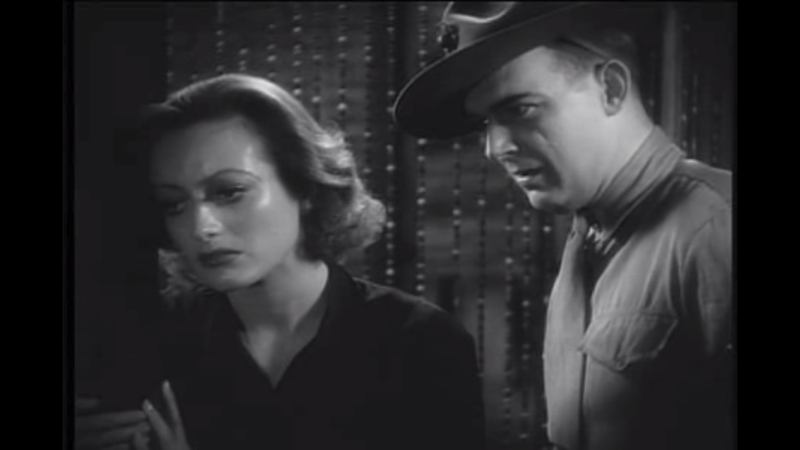 While stranded in a hotel on a South Seas island, a prostitute (Joan Crawford) on the lam from San Francisco is proselytized by a judgmental “reformer” (Walter Huston) and his wife (Beulah Bondi); meanwhile, a kind American soldier (William Gargan) woos Sadie (Crawford) by tempting her with marriage and a new life in Australia. 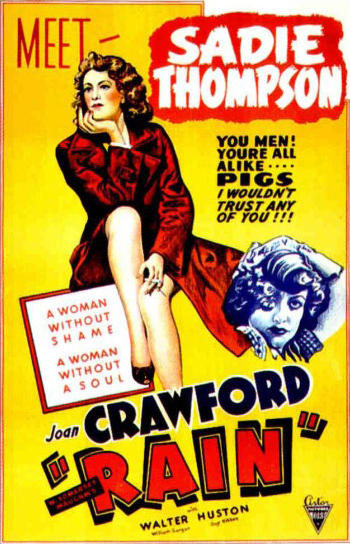 Although Joan Crawford purportedly hated her performance in this pre-Code adaptation of Somerset Maugham’s story-turned-play — originally filmed with Gloria Swanson in a silent version, and remade with Rita Hayworth in 1953 — she’s actually quite effective in the challenging role of a bold, fun-loving woman who’s cowed into submission by a bullying, hypocritical missionary. With that said, I’m not really a fan of the storyline itself; the primary problem is that we sympathize immediately with Crawford’s Sadie — especially when, after a rocky initial interaction, she makes a sincere effort towards compromise and reconciliation with Huston and Bondi — and it’s thus painful to watch her treated so badly. In addition, later climactic events between Crawford and Huston, elided over even in this relatively sassy pre-Code version, are both too vague and too unexpected to fully convince. Nonetheless, the film remains worthy viewing both for Crawford’s dynamic performance, and for how wonderfully atmospheric the entire production remains, thanks to nifty camera movements and editing, fine cinematography, and effective use of insistent rain on the soundtrack to underscore the claustrophobia experienced by all inhabitants in the hotel. Yes, as a classic Pre-Code adaptation of Maugham’s play, and for Crawford’s performance. Listed as a film with Historical Interest in the back of Peary’s book. Available for free viewing at www.archive.org. In agreement with this good assessment. A once-must, for its place in cinema history and for Crawford’s performance. ‘Rain’ holds up, in a bit of a creaky way – even if it’s a bit slight and somewhat repetitive. Most of the performances lean toward ‘functional’ – and Huston is surprisingly colorless (though, admittedly, he’s playing a colorless man) – but Crawford does keep things interesting. 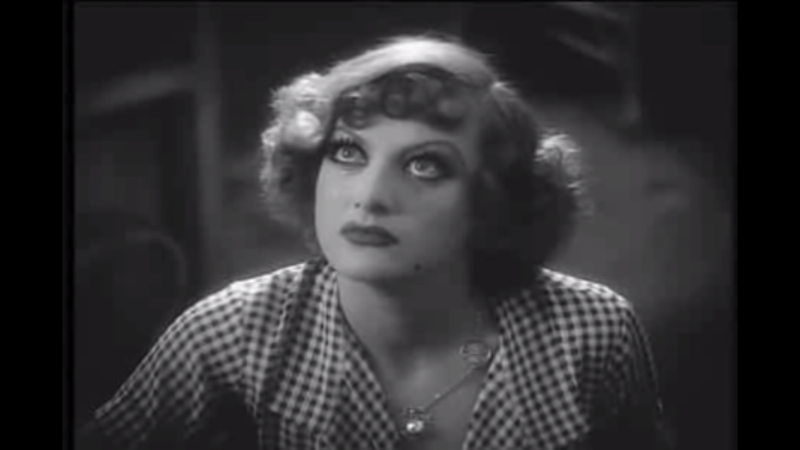 The transition of Joan’s Sadie midway is a bit of a stretch, but probably only because of the shortness of the film; it’s not unrealistic. At any rate, it leads me to what I like most about this film: the last ten minutes. That’s where Crawford is at her best – when she’s able to use the information of having been duped. Her Sadie – a woman who was previously convinced that she knew what the world and its inhabitants were about – is then set for life, solid in the conviction she’d been clinging to (and rather content with) all along. cf: Kim Novak in ‘Jeanne Eagels’, in which Novak re-creates the experience of Eagels’ long-run stage performance as Sadie.